DETROIT—One year after a Detroit police assault team shot 7-year-old Aiyana Stanley-Jones to death in her home while A&E’s “First 48” TV show was filming, neither Wayne County Prosecutor Kym Worthy nor U.S. Attorney General Eric Holder have brought charges against those responsible. “This was an assassination by video,” said Roland Lawrence as he and others watched a small plane fly a sky banner demanding “Justice for Aiyana Jones” over the east side Detroit neighborhood where Aiyana lived with her family, on the anniversary of her death May 16. 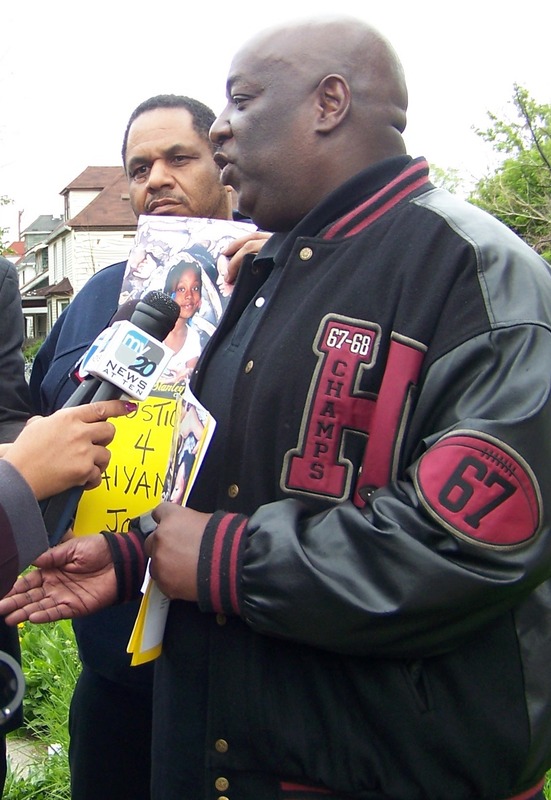 Lawrence heads the Detroit-based “Justice for Aiyana Jones Committee (JAJC),” which conducted a Facebook campaign to raise funds for the company Traffic Displays to fly the protest banner. The plane repeatedly looped over Aiyana’s neighborhood and east-side Detroit, to the downtown Detroit headquarters of Prosecutor Worthy and the Detroit Police, and back. “We are demanding that the Detroit Police Department and A & E be criminally charged with the death of Aiyana Jones, and that Detroit Mayor Dave Bing and the Detroit City Council acknowledge that the Detroit Police Department acted in total disregard when they actively participated in the killing of Aiyana Jones,” the JAJC said in a release. Cornell Squires of the JAJC said he has worked for years against police brutality since he and his family were victimized by Detroit police officers Robert Feld and William Melendez. 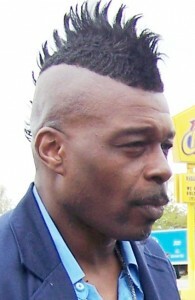 He is also a co-founder of the Original Detroit Coalition Against Police Brutality. 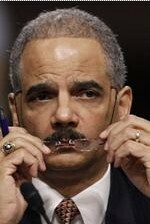 on the job while his union appeals his recent discharge for overtime fraud. The family’s attorney Geoffrey Fieger said they were very grateful for and supported the memorial protest. He has filed civil lawsuits, one against the Detroit police, and one against A&E and “The First 48,” on behalf of the family. Aiyana’s grandmother Mertilla Jones expressed profound grief on the first anniversary of the child’s death, in comments on her Facebook page. 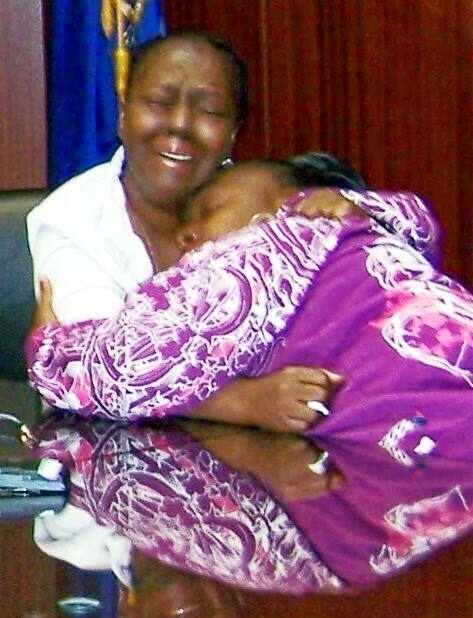 The little girl was sleeping with her grandmother on the family’s living room couch at 12:30 a.m. May 16, 2010, when police tossed an incendiary grenade through the window directly above the couch. Fieger commissioned a second autopsy which showed that an officer shot Aiyana through the top of her head from the doorway, as the bomb exploded. Detroit police identified the officer as Joseph Weekley, a featured star on “The First 48” for several years before Aiyana’s death. He previously shot two dogs to death in front of small children in another home invasion. Aiyana’s cousin said he warned the “Special Response Team” that there were children in the house when they threw him to the ground and handcuffed him prior to the assault. The police said they had a murder warrant for Chauncey Owens, who lived in the upstairs flat above Aiyana and her family. Fieger said later that a police surveillance car saw Owens leave the flat at 6 p.m. the previous day and could easily have arrested him then. Owens pled guilty to killing 17-year-old Je’Rean Blake Nobles on April 11, after numerous pre-trial motions filed by his attorney. They included motions to suppress statements and for a competency hearing. He is scheduled to be sentenced May 23 in front of Wayne County Circuit Court Judge Richard Skutt. He is allegedly to receive a reduced sentence in exchange for saying that Aiyana’s father Charles Jones gave him the gun he used. Tracy LaRock and a friend were in the Warren-Conner shopping center parking lot as news cameras gathered to film the sky banner. 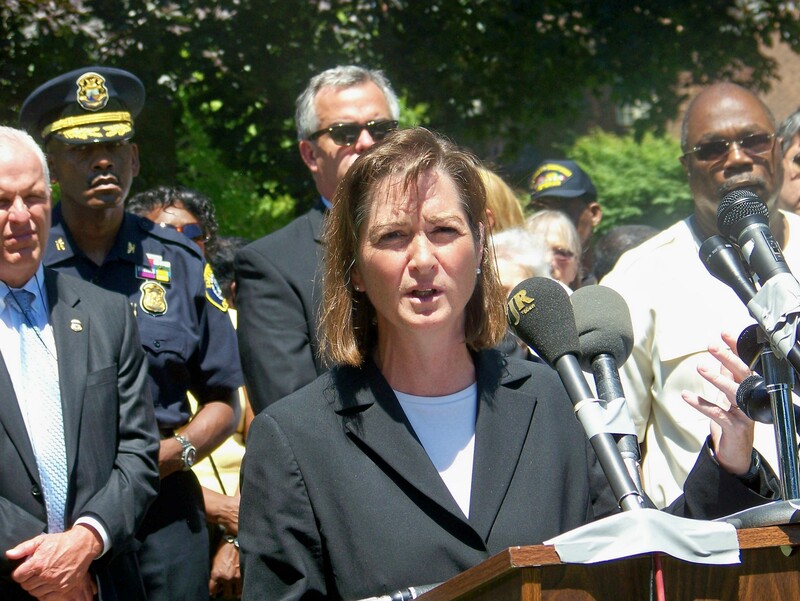 Worthy gained national publicity for bringing perjury charges against Detroit’s former mayor because he denied having an affair with his chief of staff during testimony in a civil lawsuit. 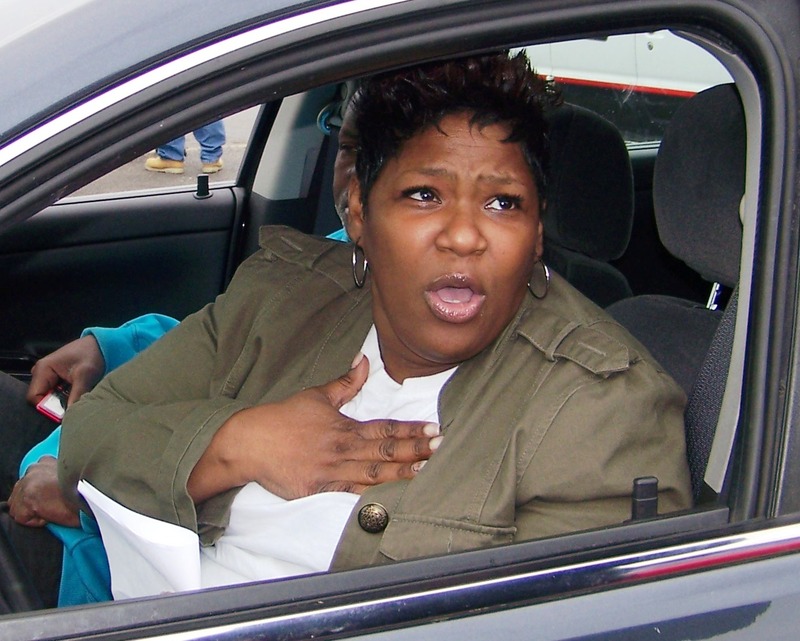 She recently asked the state parole board not to grant him early release. 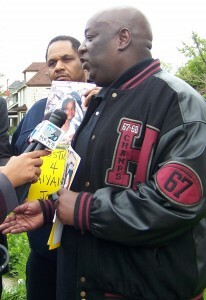 Lester Barnett, chef at the Detroit Yacht Club and owner of classycaterers.com, said he lives in the neighborhood where the police killed Aiyana. Worthy immediately turned the investigation of Aiyana’s killing over to the Michigan State Police, saying she wanted to avoid the appearance of a “conflict of interest” because of her ties to the Detroit police. “I agree that it is most appropriate that this be done independently,” Worthy said then. In the past, Prosecutor Worthy’s office has informed this reporter that cases were still under investigation, when in fact the investigations and the cases had been closed for some time. Before press time, the office of U.S. Attorney General Eric Holder had not responded to a request for a statement on whether they will investigate the killing of Aiyana Stanley-Jones in response to community demands for justice. Also go to story below to view TV coverage of the aerial protest by reporters Amy Lange (Channel 2) and Val Clark (Channel 7). The JAJC reports that Traffic Displays did an excellent job making and flying the banner, for a very reasonable price. To contact that company, call 616 225-8865 and speak to Cynthia or Jason. 8 Responses to JUSTICE FOR AIYANA JONES NOW! Hello to all. 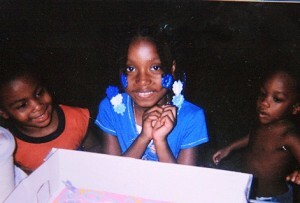 I was in Detroit, MI visiting at the time of Aiyana Jones’ death. I feel as though it is not okay for the police to get away with anything. They took a precious little girls life who didn’t even have a future because it was taken away so early. I don’t know Aiyana Jones and her family but I will always keep you in my prayers. Aiyana Jones you will get justice!! Keep watching over us. We love you. Regrettably, most of the promise of American life has become an illusion and you are left with a mere shell game of deceit and even expressive self-delusion within the struggle for power between self interest (and self protectionist) groups. The so-called “justice” system is just one of those groups. They understand that the whole of the system, from “child” welfare workers through to supreme court judges, rely upon the co-operation (and the protection) of those who are authorized to carry and publicly use guns. They know the relationship is symbiotic, that is, each element in it is “different” from each other in some very fundamental ways but each element in the “system” is dependant upon the other for the success and well being of each part of the entire “system”. Your Kym Worthy sees police like police see a police dog …. an animal trained to be dangerous to be useful and an animal which must treated kindly by those involved with it to gain it’s loyalty, respect and PROTECTION! Do too much to upset the police and when she calls police because some citizen who feels they were wronged by her is stalking her (a real possibility in a prosecutor’s life) she knows they will not come (there are many cases of police doing that to each other in real life) to help and protect her. As sympathetic as she may or may not be, it is likely that she has thought about it and rationalizes that since she can not repair the damage and bring little Aiyana back from death and that she risks the loss of police protection if she presses charges, it is likely that she will (as will almost everyone else), just coast along with the flow. 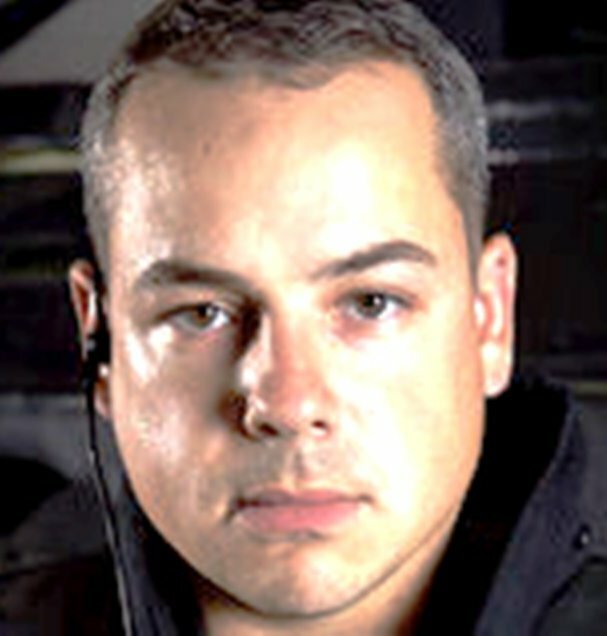 In an ideal or functioning society, Mr. Owens would have been either been prevented (rather then assisted) from killing an innocent young man and, when he did kill, would have been subdued by those around him (rather then assisted to escape) and held for authorities to take him into custody. Mr. Owen’s society is neither ideal nor is it functional. While Mr. Owen’s and those who helped or failed to impede him is/are not responsible for the development of a dysfunctional community and a closed “justice” system, he/they are responsible for their own actions or reactions. When I raised the issue of the A&E presence and what that meant in how the police “acted” in the attack on the Jone’s residence in the FB group, “She Has A Name, Aiyana Jones” two or three days after the killing of little Aiyana, some people actually posted protests in response that they always watched and “loved” the A&E show! When Mr. Jones posted his feelings of helplessness, hopelessness on that page, I assured him that he was correct in what he felt and that many of us were also very distressed by what had happened it was that we just “did not know what we could do about it”. Given all of the circumstances and despite of how much time I have thought about it, I still do not know what we can do about it, but, Ms. Bukowsky, God Bless you for trying! I lend my wholhearted support to the Jones family. I was outraged the day the news broke and the days following it when we realized DPD was scrambling to tell one lie after another to cover up her killing. While granted, I doubt Officer Weekley went in there with the specific intent to kill a little girl, fact is he did it and then lied about it. That’s what incensed me to all heights! Even if he did not have the intent to specifically kill her, he and that raid team KNEW there were children in that home from the hours long surveillance earlier that day when they saw them outside playing, toys scattered in the yard, etc. 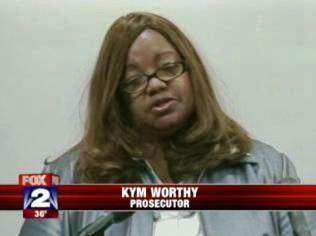 When the State Police announced a sealed warrant request for an arrest in this case back on March 4, 2011, I appeared at a televised news address on the family’s behalf to demand justice in a message clearly addressed to prosecutor Kym Worthy. Here we are today and she is deliberately delaying issuing charges or acting on the State Police’s request. We want justice for that little girl, and we are going to get it! And so we intend to make that demand known, in addition with all our other demands to the prosecutor on yet another scandal in which she has deliberately failed to rectify the problem of granting new trials to many wrongfully convicted defendants involving the now defunct Detroit Crime Lab, on June 17, 2011 at 8 a.m. on the steps of the Frank Murphy Hall of Justice. We would hope the Jones family will be there with us demanding she hand Weekley over to face justice at a time when she also continues to allow wrongfully convicted defendants to sit in prison and rot. We are also outrage at her claims that she too needs to do a “thorough” investigation before acting on the State Police’s request for a warrant. How many investigations does this woman require? It is just a delay tactic on her part to hope that the opposition will go away. Kym Worthy? Get ready for a great noise on June 17. We’re fire up; we’re mad as hell. I wrote a poem about this tragic incident over a year ago called Lillibridge St. that’s on my CD……..At the time I had no idea that it would take this long and I hope that you continue the battle. Eventually in God’s time justice will come …….. Was all of this worth it for reality TV? …….. and that’s all that I have to say Weekley & A&E. Do not give up on your efforts. It is when you reach your wits end that you must find fuel to forge on; and I will join you. I will be in touch with you about your case, to do a separate story. Your courage must be admired as well as your point that Aiyana was not alone–African-Americans everywhere are being murdered by the police and other agents. Thank you for continuing this battle against all odds.